The Saturday Mothers of Turkey gathered in the Galatasaray Square in Istanbul this week again instead of visiting their children at their graveyards. 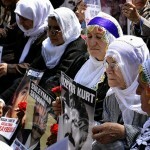 Meeting at the Galatasaray Square for the 437th time this year with the pictures of their beloved ones who have disappeared, the Saturday Mothers protested the Ergenekon trials, stating that the defendants were not taken to court for the disappearances in detention. The mothers held their protest with a heart heavier than before as it was the Ramadan Feast, a Muslim holiday marking the end of Ramadan and is mostly celebrated with all family members. Emine Erbek, Ahmet Kaya’s daughter, was the first one to speak at the gathering. Stating that they do not even have a grave to visit during the Ramadan Feast, she called for an urgent peace to prevent further deaths and disappearances. Şerif Taşkaya, son of Hüseyin Taşkaya who disappeared in the Kurdish province of Urfa, said that his father disappeared in detention in 1993 by the JITEM (Gendarmerie Intelligence Organization). Taşkaya said they have been looking for his father in the streets but could not make their voices heard, emphasizing that Ahmet Şentürk, one of the defendants of the Balyoz trial (Sledgehammer trial), was one of the responsible people behind the disappearance. Taşkaya added that the disappearances in detention, torture and murders by unknown assailants were not investigated in the Ergenekon trials and that it was only the attempted coup d’état against the AKP government that was brought to court. “Human life or political power? Which one is more important?” he asked. Ali Ocak, brother of Hasan Ocak, another disappeared man, said that the crimes against humanity have been covered up in the Ergenekon trials. Reminding that their application to be an intervening party in the trials was rejected even though the Gazi quarter riots were included in the court file, Ocak said that the AKP government has the biggest responsibility in covering up the crimes against humanity. Sebahat Tuncel, an Istanbul MP of Peace and Democracy Party (BDP), stated that the Saturday Mothers have been struggling to visit the graves of their children for 437 weeks. “It is in the hands of the government to ease the pain of the families,” Tuncel said and added that the Turkish state knows where the bones of the disappeared people are. “If there is going to be a solution to the Kurdish issue, the bones of the disappeared must be given to their families and the state must give an account for them,” she said. Then, Kadriye Ceylan, mother of Tolga Baykal Ceylan who disappeared 9 years ago, began to speak. Having put Tolga’s chess board, music CDs, and football on her banner, Ceylan said that her son disappeared in İğneada where he went on holiday in August 2004. “Time stopped on August 10, 2004. As mother and son, our lives were suspended on that day,” she said. Ceylan added that she does not celebrate any feasts and all relatives of the disappeared live in the past. The weekly statement of the Saturday Mothers was read by Ümit Efe, the President of the Istanbul Branch of the Human Rights Association (IHD). Stating that the Ergenekon trials which had continued for 6 years were finalized, Efe emphasized that some of the defendants were also responsible for the disappearances, which was the reason why the IHD applied to intervene in the trials. We demanded for 6 years that the Ergenekon and Balyoz trials be turned into a real trial for judging the deep state so that it would include all crimes committed against citizens on behalf of the state. Efe added that they asked brigadier Levent Ersöz, captain Zekeriya Öztürk, colonel Hasan Atilla Uğur, colonel Levent Göktaş, colonel Arif Doğan, Semih Tufan Gülaltay, and general Engin Alan about the death lists. The answer of the Judiciary was ‘your demand is outside the scope of the trials.’ These trials could have been an occasion for the democratization of the country. Instead, they were paralyzed with a vengeful mindset and served nothing but intensifying the “Ergenekon” mentality of the rulers by failing to include the crimes against humanity. If the definition of crime and criminal is based only on the crimes committed against the state, skipping the crimes against citizens, it means that the law is suspended. Ümit Efe also told the story of how Tolga Baykal Ceylan disappeared. “Are the intelligence service, law enforcement agency, gendarmerie, ministry of interior and ministry of foreign affairs of the state unable to have access to the information on what happened to Tolga? Isn’t it your duty to reveal what was done to Tolga?” he asked to the officials. The gathering was finalized to be held again next week at the same hour.